Smart Factory, Industry 4.0, self-controlling production – the mechanical engineering sector is currently looking far into the future. The pace of innovation and reduced development times play an increasingly important role in global competition. To simplify engineering processes and increase reusability of the individual units, design engineers are focusing their attention on a modular design for machinery, in other words on a mechatronic approach. The mechatronic approach is a success factor for businesses when developing new plant and machinery. The term “mechatronic” reflects the interaction between the “mechanic and “electronic” domains. A system built in accordance with the mechatronic approach essentially consists of modules. Each module contains sensors, actuators, information processing and a mechanical base system (hydraulic and/or pneumatic). In terms of the challenges, only strict, interdisciplinary “modular thinking” will bring success in the medium and long term. Control systems play a key role here and must support this approach. This is where today’s systems reach their limits. On the one hand, although software modules can be created, if these are to be executed by powerful, centralised control systems, commissioning of individual modules becomes quite complex. On the other hand, local control systems can be used for automation of the modules, but this requires additional effort in establishing communication. So the number and layout of the control units should ideally be based on the overall mechatronic design of the machine. These matters must usually be cleared up prior to design, to avoid causing the considerable expense of subsequent modifications. 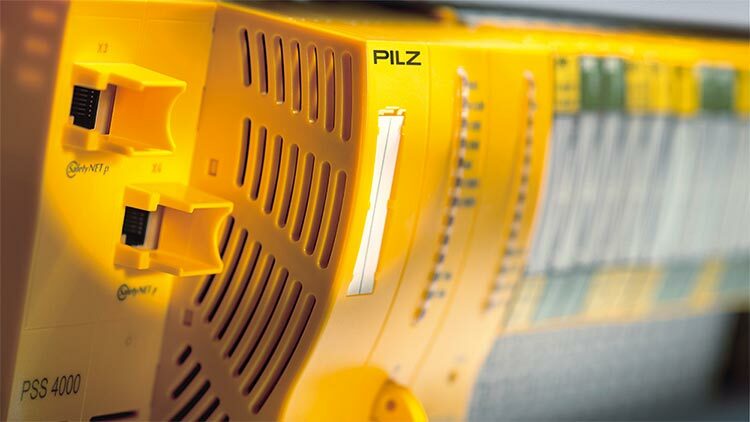 The automation system PSS 4000 from Pilz opens up new possibilities in this area. Due to its decentralised structure, decisions such as the selection of a PLC to suit the design and control architecture can be postponed to a much later point in the design phase. So design engineers can concentrate on the design of the components required for the process; issues of performance and structure can take a back seat. Whereas in classic automation a standalone, centralised control system monitors the plant or machine and processes all the signals, the PSS 4000 allows control functions to be distributed consistently. In detail, the automation system PSS 4000 consists of hardware and software components such as the real-time Ethernet SafetyNET p and various programming editors designed for use in different sectors, with their application-oriented function blocks. The hardware includes control systems of various performance classes. Process or control data, failsafe data and diagnostic information are exchanged and synchronised via Ethernet. Complexity in the field of communication is reduced by consistently merging safety and automation functions, while costs are also optimised. What’s more, it makes no difference to the control function where the respective program section is processed. Instead of a centralised control system, operators work with a user program distributed in runtime within a centralised project. The Pilz Automation Suite PAS4000 is available for the software editors in the automation system PSS 4000. Modularisation is a key aspect of this tool: elements are created from the basic functions; the elements in turn are used to create modules and the modules are used to create plant and machinery – simply through hierarchical block nesting. Basic functions, elements and modules form the backbone of the software development and are ideal to re-use as software components thanks to encapsulation and object orientation. Pilz also supports this procedure by providing software libraries containing the most common basic functions, elements and modules. The selection of ready-made components from libraries is itself nothing new. A special feature of the PAS4000 is that these components have been assigned “properties”. These allow the parameters for the required functions to be set simply. This is a particular benefit in terms of the standardisation of functions: previously the user had to ask himself how many functions he could bundle into a block without adversely affecting clarity. In practice the result was either a vast number of blocks, or too few blocks with a vast number of parameters. With PAS4000 it’s different. Here the user can create his preferred components, establishing a user level for their application; this is then used to select the various functions. As a result, only the function is visible as a parameter; the component itself hides any complexity and remains easy for the user to manage. The use of components has an additional advantage: programming and hardware design can be split and can be run in parallel, not in sequence as before. It’s common practice for the software development only to start once the machine specification has been established and the initial electrical circuit diagrams are available. If you think and design mechatronically, the processes can be split and run in parallel. As soon as the machine functions are standardised by creating components within libraries, the overall structure of the machine you wish to build can ultimately be designed with just some initial information. The detailed function of a component can be established later via the individual properties. The components that the machine will require can be roughly deduced from the initial project approval of all the faculties. Detailed functions can be defined retrospectively via the properties. A considerable amount of work is involved in establishing and maintaining communication between subscribers on a modern machine network. If you consider that mechatronic modules are also hardware modules and therefore include control intelligence in each module, then communication between modules, or rather between module control systems, becomes a key issue. With PSS 4000, the communication setup is no longer explicit, but implicit. Firstly, all information is known and accessible equally to all network subscribers. Secondly, the communication channels of the control modules and individual modules are known to the whole project and are set up independently by the tool in accordance with the assignment, i.e. program distribution. The mechatronic approach places increased demands on the control solution. That’s because changes in individual plant sections have far-reaching effects at control level, because program structures at central points of the control system need to be modified. That’s why automation of the future demands solutions that are able to distribute control intelligence and guarantee that the necessary networking of several control systems remains easy for the user to handle. If you examine a machine’s life cycle, the benefits of a mechatronic approach become clear, particularly in the design and commissioning phases.